Our iconic hiking boot for women brings an updated look to all-terrain adventures. We carried over the fit, durability, and performance of our award-winning Targhee waterproof boot and took its rugged looks to a new dimension. Waterproof leather and performance mesh upper. Leather mud shields for resilient durability. KEEN all-terrain rubber outsole for higher traction grip. All KEEN water sandals are machine washable. Use a small amount of detergent, wash on gentle cycle and air dry. Gently brush the shoe with a soft bristle brush or hand towel to remove loose dirt and debris. Stains can be treated by lightly rubbing a gum eraser in a circular motion over the location and lightly brushing afterwards. Tough stains can be treated with a mixture of water and a little vinegar on a damp cloth. This process may cause slight discoloration to the area. We recommend you clean these products using mild soap and cold water. To remove excess dirt or spot clean, use a stiff brush or soft cloth. Let shoes air dry away from heat. 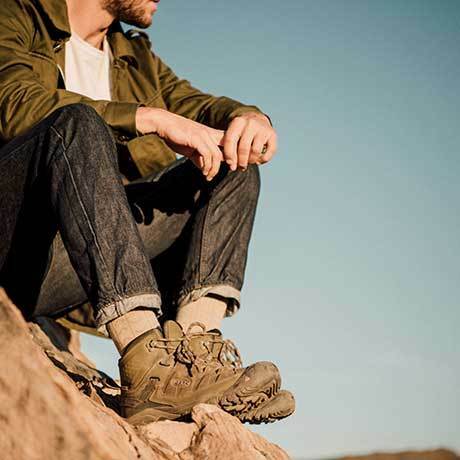 Get all the latest information from Keen Footwear.